Look who is hosting the Golden Globe Awards 2019! 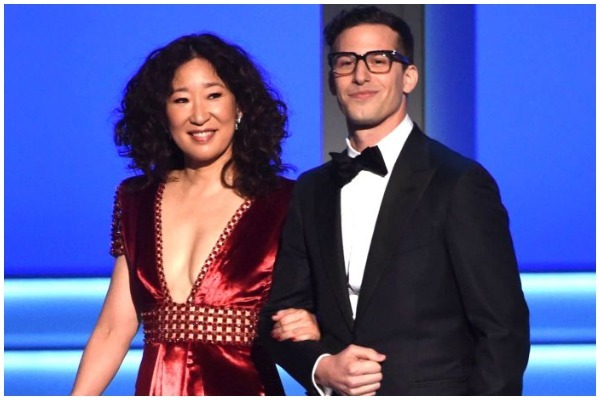 “Grey’s Anatomy” star Sandra Oh and “Brooklyn Nine-Nine” star Andy Samberg are the officially announced names by Hollywood Foreign Press Association(HFPA) to co-host the Golden Globe Awards 2019. NBC will broadcast the 76th Annual Golden Globe Awards live at 8 p.m. ET on Jan. 6, 2019. from L.A.’s Beverly Hilton. The duo had earlier co-hosted this year’s Primetime Emmy Awards for which social media praised their chemistry and sense of humor. Sandra Oh is currently starring in “Killing Eve” as MI5 officer in crime drama television series for BBC America and she serves as executive producer as well. American actor and comedian Andy Samberg is a former writer and player on “Saturday Night Live”. He is a member of the comedy music group The Lonely Island. Sandra won a Golden Globe in 2006 for or actress in a supporting role in a series for “Grey’s Anatomy.” Whereasm Samberg is two-time Golden Globe winner – as producer and actor of “Brooklyn Nine-Nine”.